Disclosure: Storey Publishing LLC sent a copy of Knitting Fabric Rugs to Lapdog Creations for review. I was not compensated for this review and all opinions expressed are my own. Stuck in a hat/shawl/sock/cowl rut? Looking to take your knitting skills in a bit of a new direction? It's easy - just arm yourself with a copy of Knitting Fabric Rugs, some colorful strips of recycled fabric, and a pair of size 10 needles! Trends come and go, but colorful accent rugs seem to be a new staple of contemporary design. Unfortunately, some of these fun, little pieces can sell for hundreds of dollars - not exactly fitting into everyone's budget. I'm sure I'm not the only one who's thought "why would I spend $300 on that when I could make it myself?" So, why not make it yourself? You probably have all of the materials you need hanging in your closet... collecting dust. It's time to upcycle! Don't toss your old clothing into the donation pile, reuse and repurpose it into colorful, fun, knitted rugs! In Knitting Fabric Rugs, Karne Tiede teaches an innovative technique for creating fabulous designs. Karen was inspired by handwoven rag rugs and bags. Combining her love of these DIY projects with her background in knitting, Karen created her own method of upcycling fabrics into beautiful rugs. Instructions for 28 different rugs are included, many of which draw inspiration from traditional quilt patterns. Karen also discusses her own inventive approach to color blending, spiral patterns and freeform design. Perhaps you're a beginner knitter wondering how on earth you could create these beautiful rugs? No worries... you don't need to be a master knitter to create masterpieces! The rugs require a knowledge of just the simple knit stitch and are worked in modular sections, which are later sewn together. This helps to make the projects portable (which is something all knitters love) and easy to work on. Knitting Fabric Rugs has inspired me to take a second look at my Goodwill pile and rethink what I can do with some favorite, but well-worn, t-shirts. While I haven't started a knitted rug project just yet, I look forward to working on one... most likely over the winter, after the holiday knitting rush slows down. About the Author: Karen Tiede markets her rug designs on her website, Rugs from Rags. In addition to doing her own design work and teaching, she is also a weaver and woodcarver. Karen lives in Moncure, North Carolina. 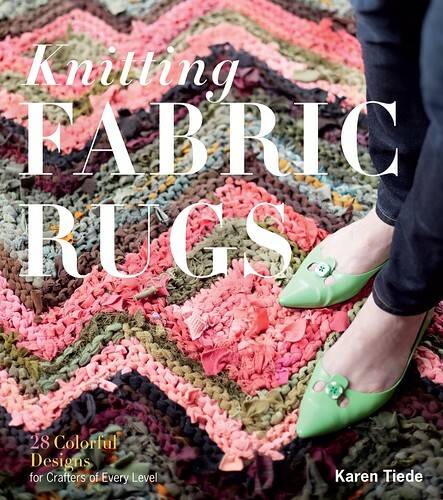 How would you like to add a copy of Knitting Fabric Rugs to your book shelf... for free?!?! Thanks to the folks over at Storey Publishing, we are giving away a copy to one lucky reader. Thanks for joining the blog hop!!! PepiSmartDog: Hi there! We love knitted fabric rugs! Love the rug in the piccie. Mom has never tried doing it, but it looks like it might be fun. Love the way they can be so colorful. I keep saying I want to try this... but I'm not doing so well with the hobbies I already have! I'm going to turn old tshirts into a rug. My mom has lots of fabric samples from her interior design business that I may be able to put to good use! I'll pass on this one. I made a rug once and couldn't bear the thought of anyone walking on it. I wound up hanging it on the wall.